Henry Rosenberg and his wife, Augusta, are pacifists on Christian grounds, but he still feels obligated to join the Union Army in 1864, even though he’s old enough to avoid conscription. 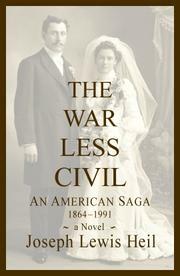 Augusta loathes Abraham Lincoln almost as much as war itself and feels betrayed by her husband’s decision. Henry eventually returns after witnessing the grisly horror of combat. His experience haunts successive generations of his family, as his descendants also wrestle with the moral conundrums presented by war. Henry’s daughter, also named Augusta, has a similar rift with her husband, John Helden, over the country’s entry into World War I. This pattern of familial struggle continues all the way through World War II, the Vietnam War, and the first Gulf War. Each time, the family’s ordeal microcosmically mirrors the identity crisis of the nation as a whole, representing evolving attitudes not only about America’s place in the world, but also about women, commerce, and the social fabric itself. Author Heil structures the plot around war but also includes dramatic depictions of Prohibition and the impact of socially divisive issues, such as abortion. A finalist in the 2011 Faulkner-Wisdom Novel Competition, this book is an ambitious tour de force. It attempts to do double duty by realistically portraying individual people, as well as the nation at large, over the course of more than a century. Unsurprisingly, the plot meanders sometimes, and the characters get languorously lost in seemingly interminable political debates. These disputes are occasionally cast in tendentious tones, making one side seem hyperbolically unsympathetic. (A debate before an audience over Roe v. Wade, for example, depicted at great length, makes the pro-choice advocate seem shrill and dogmatic.) Even so, the author’s success at capturing the internecine conflict in generations of one expanding family, without reducing them to abstract symbols of larger political referents, is remarkable. Overall, this is a powerful, moving tale, reminiscent of John Steinbeck’s East of Eden in its scope and artistic aspiration.